Science/ Tech/ Space and Sci-Fi; The human experience in the 4th age. ← 2013: 1st of 13 Things I Want to Know: Is the Tweeting ISS Astronaut Happy with his ISP? 2013: 2nd of 13 Things I Want to Know: When is Iran’s President Going into Space? 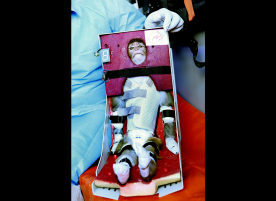 Did an Iranian monkey in fact get to space last month? Will Ahmadinejad in fact be next? There was no independent confirmation to Iran’s claim that they launched a monkey into space, but this story was all over the news last month. There was also a debate about a discrepancy in published pictures of the monkey. Those were explained: the explanation given was that some of the pictures were from archives, possibly involving a monkey that died in a 2011 failed launch. In short, it is possible that this did happen, that there was a successful attempt to launch a monkey into space, before such an attempt is made by Iran with humans. The monkey in the picture looks quite frightened. Not sure if this is before, or after. In any event, Iran’s absolute ruler said he’s willing to be the first human to be sent to space aboard an Iranian rocket. For real? After looking at this picture? What are the chances? Many don’t believe this can happen, due to the time involved and his current age. Many others hope that this will happen, and give the population some relief from what they believe is a pretend democracy. And, of course, since everyone has their own point of view, some folks are not concerned about the monkey, or about the Iranians chances of saying ‘Bon Voyage’ to their president, rather they are concerned with Iran’s show of launch capabilities. But hey, what do I know? I really am curious to know if Ahmadinejad will go, but I’ll believe it when I see it, in news from a non-Iranian source. Science/tech/space and sci-fi connections; the human experience in the 4th age. This entry was posted in Human Experience, Space Exploration and tagged Ahmadinejad, Iran, Monkey, Rocket Launch. Bookmark the permalink. Space Tech Expo - Moon Rush! Follow! Just enter email address above.